In today’s podcast, Jonathan Chevreau, author of Findependence Day, discusses how to use guerrilla frugality to eliminate debt and become financially independent. “Findependence” is a combination of the words “Financial” and “Independence”, and it’s not the same as the concept of “retirement”. Retirement is the end of your working career. You work, then you stop. When you are financially independent, you may decide to stop working at your normal job, or you may keep working. You may reduce your hours, or perhaps start working at a new job or career. You may work part time, or you may turn your hobby into a source of income. The point of “Findependence” is that you decide. You work because you want to, not because you have to work for the money. It’s impossible to be financially independent if you are carrying debt. Eliminating credit card debt and other high cost unsecured debt is the first step. How do you do that? Mr. Chevreau explains his concept of guerrilla frugality: to live as frugally as possible, so that you can pay down debt, and then start saving money. On the show we discussed home ownership. Mr. Chevreau believes home ownership is an important building block of financial independence. Doug Hoyes makes the comment that owning a home is great, but only if you can afford the mortgage. Excessive debt is never wise, so only take on a mortgage that you know you can afford. In the podcast only segment of the show (not heard on the radio), we discuss the concept of a “mini-retirement”, where you take a period of time off work, and then return to work. It’s a great concept (why wait until you are “old” to retire? ), but it’s only possible if you are financially independent. Jonathan Chevreau was the personal finance columnist for the Financial Post and the National Post for almost twenty years before joining MoneySense Magazine in 2012, where he is currently the Editor-at-Large. He is also the author of many books, including Findependence Day, which we will touch on today. You can read his blog at moneysense.ca. To get out of debt, Jonathan suggested taking the concept of balancing your budget one step further, to something he calls ‘Guerrilla Frugality’. He suggests we should live below our means, not just for a year or two, but as a life-long habit. Only by doing so can you pay off your debts and build a strong financial foundation that will support you throughout your life. I am happy to say that I am finally able to put some money into a savings account each month; I am no longer living pay cheque to pay cheque. For this I am forever grateful to Hoyes Michalos and your staff. Thank you from the bottom of my heart. Scroll down for a full version of this transcript. Doug Hoyes: Welcome to Debt Free in 30 where every week we take 30 minutes and talk to industry experts about debt, money and personal finance. I’m Doug Hoyes. Today I’m very pleased to be joined by Jonathan Chevreau, a very well known Canadian personal finance writer. Mr. Chevreau was the personal finance columnist for the Financial Post, and the National Post for the better part of two decades before joining MoneySense Magazine in 2012 where he’s currently the editor at large. You also see his work appearing in many other places including The Post still. He is also the author of money books, including Findependence Day which we’ll touch on today. You can read his blog at MoneySense.ca and I’ll include links to his book and his blog in the show notes. Jonathan, thanks for joining me. How are you today? Jonathan Chevreau: Very good, Doug. It’s a pleasure to be with you. Doug Hoyes: Thanks for being here. Let’s start off with this word Findependence which I believe is a word you coined or certainly popularized. Are you talking about retirement? 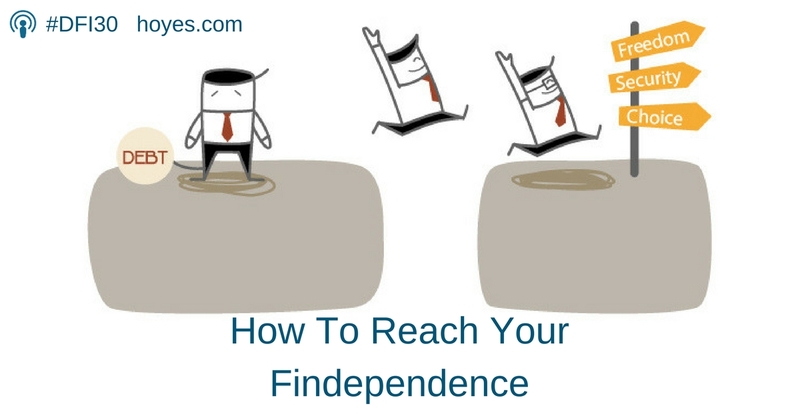 What exactly does Findependence Day mean? Jonathan Chevreau: Yeah, well, Findependence is just a contraction of the terms financial independence which is a bit of a mouthful so in the book, I have the financial planners saying how he just started to just compress it to Findependence and of course Findependence Day, it started from Independence Day in America so July 4th and I figured Independence Day and Findependence Day, financial independence so it’s really just the day that your income from all sources exceeds what you get from a single client or what we normally called a job. So if you’re being paid $5,000 a month as an employee and your investment income and rental income and everything else is $5,500 a month, in my book, that would make you qualified to be Findependence and to start doing what you — in most cases, you’re going to continue to do what you do anyway because life is a lot of experience and 35 years without a paycheque or watching daytime TV isn’t my idea of a good time. Doug Hoyes: And that’s what the traditional view of retirement is I guess. I work up until I hit the age of 65 and then I completely come to a full stop and as you say, watch daytime TV. That’s not what you’re talking about. So you are already financially independent, you’ve already reached your personal Findependence Day, is that correct? Jonathan Chevreau: Yeah, I actually declared it about a year ago when I turned 60 but I stayed another year at MoneySense (and this is predicated on martial harmony of course) so I’m looking at it as a couple, to act sufficiently, so it’s about the same as retirement. I think the financial industry and the media, they’ve got this term retirement but as people like Lee Anne Davies has been on your show before and talked about, you know, you can be Independent in your 30s. I think you should strive to be Independent in your 30s and that’s where your business of getting out of debt, avoiding a bankruptcy and all these financial mistakes comes in. There’s a genre called early retirement, extreme early retirement where people save 50 to 70% of their money, unrealistic I realize for most of us. And they try to “retire” within five years in their early 30s. I’m not that extreme. I’m in the “save 15 to 20 percent of your money consistently over 25 to 30 years” and then try to retire perhaps late 50s, the old Freedom 55 or your early 60s. Doug Hoyes: So if we were to record another interview, you know, 10 years from now when you’re 70 years old let’s say, how would your life be different than it is today? Would you still be doing writing? Would we still see your name appearing in places or would you have completely shut it down by then? What do you think the next five or 10 years hold for you? Jonathan Chevreau: I just wrote a three-year business plan so I can answer that pretty precisely, Doug. When I’m 70, I don’t think I’ll be selling my time as a writer. I would hope to be commanding exorbitant fees for public speaking, and when I write a book, which will be every two years, it’ll be a New York Times bestseller, everything else would flow from that. I don’t think I’d be writing blogs for several hundred bucks at a time so to me, and I’m also trying to automate just the way you have investment income coming in automatically 24/7, I want to do the same thing with the internet. I’ll be launching a site called FinancialIndependenceHub.com rather shortly so it’s not just what I’ve got right now with FindependenceDay.com selling the book. So I’m really just living the life that I describe in the novel. Doug Hoyes: Perfect. Perfect. And when that site is live, you’ll have to let me know and I’ll make sure I can put a link to that in the show notes on the site as well because that will be quite interesting. So you mention the word debt and obviously this is a show about debt so I assume that it’s obvious that debt is a significant and perhaps the most significant barrier to your own personal financial independence, is that correct? Jonathan Chevreau: Yeah, to me, debt is just something to be dispensed with as soon as possible in the life cycle. It starts with student debt and there’s been stories on the last couple of days, the next thing obviously is non-deductible consumer debt, credit cards. I still find it outrageous that when you’re receiving interest you’re lucky to get one or two percent on a GIC, yet when you’re owing it, as you know, what is it, 18, 20 percent out on the credit cards. Personally, I’d rather own the credit card companies. I own the stock of MasterCard and Visa. You would’ve made out like a bandit on those guys if you’d done that. So to me, it’s like yes, just wipe out all debts including the whole mortgage debt. I say in the book repeatedly the foundation of financial independence is a paid for home. Interestingly, even in the States where interest mortgage is deductible on homes, Wes Moss wrote a book, You Can Retire Sooner Than You Think and I quoted him in a couple of blogs last week and even he says and believes that you should be completely debt free in retirement, including the home mortgage, even in the United States where you can have that benefit of deducting the interest so I was pleased that he’s an influential person down there and he has the exact same thought that you have no business retiring if you’ve got credit card and still owe on a home. I personally want to have a paid for home. I don’t want to be captive to rent increases from landlords and to me, that’s security. Home Ownership – Is it a good financial idea? Doug Hoyes: So let’s talk about the whole home ownership thing. So your position is very easily understood that when you retire, ideally you want to have a paid for home so you’re not making a mortgage payment, you’re not paying rent. Obviously you’ve still got your repairs and maintenance but you live where you want to live, you own it. So for the last hundred years, that has been fantastic advice. House prices over the long term have always gone up. It’s never been an issue. So let me advance the alternate viewpoint here just to play devil’s advocate and that is to say, in Toronto now, the average home price is almost a million bucks and so someone who graduates from University with a lot of student loan debt, which tends to be typical these days, ends up spending the first years of their working life dealing with that, cleaning up that student debt and then they spend the next few years of their working lives accumulating a down payment because you have to have some money to put into the game. And if you are going to be buying a million dollar house, well, even if you’re buying a half a million dollar house, a 10 percent down payment is still $50,000, that’s a big number. Is it realistic for younger people, even middle aged people, to be aspiring to home ownership today or would they be better off, you know what, I’m going to rent a place, I know what the costs are going to be and then whatever extra money I’ve got goes into investments. Does home ownership still make sense even today? Jonathan Chevreau: I think so. As I say, you’re going to have a mortgage either way. You either pay your landlord’s mortgage when you’re renting or you’re going to pay your own mortgage. The problem with renting in my view is I understand that Toronto is expensive, although I wouldn’t say a million dollars is — I’d say it’s closer to half a million for the average home or maybe the median home, but regardless, the landlord is going to — inflation keeps on happening. In my experience, because I rented a lot in my 20s and I’d wished I’d bought earlier and so did my wife when she was single and we wish we’d bought in the early 80s. As you know, Toronto’s market topped out in the 80s when we did finally buy in, but the problem with renting is the landlord is going to keep on hiking your rent repeatedly. He’s never going to stop and you have no control over that. To me, I don’t think people should get in the richest area. I don’t believe you should be 40 percent to 50 percent of your income. I mean, just because a bank tells you that you can afford a certain amount of money, you don’t have to get the best part of town and that fancy of a house. Get a starter home I say not in the ritziest area of town and not more than 20 or 25 percent of your income perhaps and then pay the sucker off in three to five years if you can with a double income, I don’t see why you cannot do that, and then live the rest of your life rent free. Yes, there’s going to be property taxes. I understand that. There’s going to be maintenance and all that but you’re not going to have this rent that you have to pay even until you’re 95 years old that continually goes up. Doug Hoyes: So buy something you can afford, get the mortgage paid off, get the associated debt paid off with it and regardless, that’s going to set you up for the rest of your life. And I guess once the first home is paid off, if you want to have the big fancy home, well, now you’ve got lots of equity, then fine, blow your brains out at that point but it’s the starting point is a reasonably priced home, get the mortgage paid off as quickly as you can. That’s the starting point from your point of view. Jonathan Chevreau: Exactly, Doug. And think about it, it means that you’ve to live below your means and frugality. In the book, I call it guerrilla frugality. It’s not something that you just adopt for two or three years and then I’ve got it made. No, guerrilla frugality is a lifelong habit. I’m still a frugal guy. I finally bought a new used car just in the spring. It was like a Camry Hybrid, good on gas, but even then again, it was a demo model, I wasn’t going to have that depreciation but the point is to pay the house down and to have no debt at all and so the point is that you have the — the frugal habits required to pay down a mortgage quickly and living within your means, the beauty of it is once you do that five years of paying down the house, at that point, one you’re accustomed to living on basically just pizzas and videos on Friday nights and not eating out a lot and not going on fancy vacations and not having the new car but because you’re used to that life style, you can continue it. And then once the mortgage is paid off, you’re already used to living below and then you applied what were the mortgage payments into financial assets, into your TFSA and your RSP, into non-registered savings so you just continue the stream of income that you were used to coming out, pay yourself first, automatic payments and that way to me, you just go seamlessly from paying down the mortgage to building your wealth. Doug Hoyes: Becomes a win-win. We’re going to take a quick break and then I want to ask you a little bit more about that phrase that you just used, guerrilla frugality. We’re listening to Debt Free in 30, we’ll be right back. We’re back on Debt Free in 30. My name is Doug Hoyes. I’m joined by Jonathan Chevreau, and we talked in the first segment about homeownership and how you can afford to pay for it. And Jonathan, you made the comment that you have to adopt this notion of guerrilla frugality. And that’s something that’s featured prominently in your book Findependence Day, give us the quick definition. What are you talking about there? Jonathan Chevreau: Well, guerrilla frugality is actually a term, I also coined that, at least I’ll take credit for it, in a column in The National Post, Financial Post, maybe eight years ago and it’s really just super frugality. There’s a section in the book that talks about how when you’re a consumer and you’re in debt and you’re assaulted by all these marketing messages everywhere, advertising, TV, billboards, you name it so you have an entire — the world is basically using guerrilla marketing and nowadays with the internet, there’s all sorts of insidious ways that they get their message across so what I’m arguing is to fight the gorilla marketers because you don’t want to be spending every cent that God sends, you have to counter gorilla marketing with guerrilla frugality. And gorilla as in [inaudible] kind of gorilla, you have to be frugger, a frugality gorilla dawning your wardrobe, your fatigues, your combat fatigues but you’re a frugality experts but all it really means is what we discussed, brown bagging it to work, not eating fancy restaurants, maybe taking vacations in off periods or not going on vacation at all, having a staycation, keeping the old car going, when you do buy a new one, have it a couple of years old, a demo model, good on gas, that’s why I like a Hybrid, like I said, it’s every part of your life. Doug Hoyes: That’s the key. It’s every part of your life so it’s not a something I do for a year so that I can save up enough money to do whatever that thing is I want to do, it literally becomes the way you live your life from that point forward. So even today then you still adopt those same principles? Jonathan Chevreau: Yes, I haven’t modified my behavior at all because the only difference I say about Findependence is once you’re Findependent; you’re now working not because you have to, financially have to, but because you choose to. Jobs like you and I have Doug, even if we’re self employed, we’re knowledge workers. We’re very privileged, we’re symbol manipulators. We deal with very interesting people, we talk about interesting concepts, we write whatever it is, we’re fortunate and privileged so of course we want to continue doing that and the social networking that goes along with it. But on the other hand, if you’re starting out in the business world and you’re in a job you don’t like, I mean, personally I was once in a computer sales job and I hated it and I quit after six months. I know, you find it hard to believe I could sell anything, and I couldn’t really, but the point is, and I remember talking to a guy and he was a sales guy — I remember coming in on Monday morning once and he had a young family and a big mortgage and his wife didn’t work and he didn’t know I’d come in and he looked so depressed. He was like his body language, I was like the Monday morning blues was personified and I think even at that moment, I realized that life is too short to work at something you don’t like. I think when you talk about Lee Anne Davies and Agenomics or Market Change Rangers, you can work until you’re 75 and 80 as long as you’re in a congenial line of work. If you’re not, then of course people are obsessed with retirement because they just can’t stand another thought of 10 more years waiting. In the old days, you’re in a defined benefit plan and you’re with IBM or the federal government and you sort of had the clock ticking, only eight more years, 45 days until my retirement and you would be free. Those days are gone, as our defined benefit pension plans, so I’m saying if you want to be, if you want to be free, find a congenial line of work and the easiest way to do that, even if you have to take a cut in pay, is to be financially independent. You can be financially independent in your 30s. It’s not something you have to wait until you’re 64 and wait for the pensions to kick in. Doug Hoyes: And so everything all flows together then, so step one is being out of debt as quickly as possible and the way to do that is to adopt this guerrilla frugality mentality. I’m spending as little as I can. I’m saving as much as I can and as a result of that, I can take on a job perhaps that pays less than the best job I can get but it’s a job I actually like, it’s a career I actually like. I’m not depressed going into work Monday morning. I actually like it and as a result, everything flows from there then. That’s really what you’re saying. It’s a much more holistic approach to everything. It’s almost a good thing I guess for some people that the defined pension plan is gone because although that was great when you retired, it was also handcuffs on your for 30 years leading up to it. Some people are probably better off that it isn’t there. Would you agree with that? Jonathan Chevreau: I have a few little income streams from defined benefit plans but it’s not like the 30 years in one place where you’re completely 90 percent of your income was going to come from that particular pension. Nowadays, read a book like Robert Allen’s, Multiple Streams of Income. And actually, he’s got another one called Multiple Streams of Internet Income. Personally, I really feel that this whole internet marketing thing is more than just a fad. B, if you can believe books like Click Millionaires and Laptop Millionaires by Scott Fox, there are young people who are embracing the internet and making 20, $30,000 a month through all sorts of interesting ways. Or another good example is what’s his name, Tim Ferris, The 4 Day Work Week where they’re basically living the life from a laptop and a Smartphone anywhere. I did a blog on Money Sense and on my own blog, FindependenceDay.com the other day and I showed the covers of some of these books. They looked like you’re on vacation because you’re on a beach somewhere and you’re laid out on a deck chair but instead of reading a trashy novel, you got a laptop on your stomach and in fact you are working. Doug Hoyes: It’s an awesome way to live. Well, I really appreciate you joining me here today, Jonathan. Those are some excellent tips and concepts and a lot to think about. Thanks very much for being here. Jonathan Chevreau: My pleasure. Thanks for including me, Doug, and yeah, stay out of debt. That’s for sure. Doug Hoyes: That’s a key. Great. Thanks very much. We’ll be right back to wrap it up. This is Debt Free in 30. We then had a detailed discussion about homeownership and his concept of guerrilla frugality which is the best way to get out of debt and to achieve your own Findependence Day. That’s the 30 second recap of what we discussed today. So what’s my take on Jonathan’s message? I agree that we should all strive to be financially independent and guerrilla frugality is a good start. By getting your debt under control and saving money, you can decide when you retire and that’s a great feeling. As for home ownership, that’s a more difficult issue. I agree that having a paid for home as you head into retirement gives you a great sense of financial security, you have no rent to pay so your living costs are lower. My only worry is that we’re often tempted to buy a house that’s bigger than what we can afford and that leads to a big mortgage and a lot of debt. Debt is the enemy so you should only get a mortgage that you are sure you can afford. Home ownership is not a guarantee of financial independence. About 30 percent of the people I do bankruptcies and consumer proposals for owned a house when they filed, so that alone is proof that home ownership is no guarantee of financial success. That’s our show for today. This show is on the radio every week and also available on our website and on iTunes. So please go to Hoyes.com for a full list of participating radio stations and details on how you can download the show to listen on your iPod or Smartphone. Full show notes are available on our websites and I’d love to hear your comments which you can leave right on our website at Hoyes.com. Thanks for listening. Until next week, I’m Doug Hoyes. That was Debt Free in 30. Thanks for listening, this was Debt Free in 30. We’re back on the bonus podcast segment. Jonathan Chevreau has agreed to stick around for a couple of minutes more, and I just wanted to ask you about the concept of mini retirement. So we’ve always had this notion in our mind that I work, work, work, work and then when I turn 65, boom, I stop, I’m retired, I collect a pension. Well, we know that defined benefit pension plans are nowhere near as common as they used to be so that may not be the people live. What then is this new concept of a mini retirement? This is a concept I guess that Tim Ferris was one of the first people to talk about it in his Four-Hour Work Week Book. What does it mean to you? Jonathan Chevreau: Yeah, I think there’s a precedent for this. If you remember the What Color of My Parachute Books, in one of those authors, Bulls I think it was, wrote something called the Three Boxes of Life. In the old days, it was basically you had your education; you went and got high school and then university. You’re in the education box. Then they stuck you in the work box for like 35 years, work, work, work, save. Ferris calls it a work/save, slave/save/retire. And then at the end, maybe you’ve got five or 10 years, as you say, a defined benefit plan where you just did nothing but watch daytime TV, play golf and Bridge. So the concept of mini retirement is like hey, why don’t you have — and even in my book I say it’s financially independent while you’re still young enough to enjoy it which ties right in with the concept of multiple mini retirements spread across your lives. Why not retire, we used to call it a sabbatical. You worked four years. They kind of prorate your pay and teachers still do it in some places and the year five, you take a year off. That is a mini retirement, isn’t it? And if it changes your whole view, you write a novel or something or simply what you discover about yourself in that year or what you do productively in that time off may mean that your life takes a whole new direction and you don’t even go back to that job, if indeed it was a job you didn’t really want to work your whole life at. Doug Hoyes: So a mini retirement could be any length of time at all then? Jonathan Chevreau: Yeah, I think so. Ferris talks in terms of months like three, four months at a time. Like I said, I’m going to Turkey in October for three weeks. I wouldn’t call that a mini retirement. I call it a micro retirement. I think traditionally a sabbatical was a year and it makes sense even if it’s two to five years. Going back to school, deciding you want to go to medical school and study, that would take 3 years or more. That’s probably an extreme example but I certainly know a lot of people who have corporate careers and they go back for one year of divinity school for example and then they become ministers, usually at a great cut in pay but they are networked into society, it’s a spiritual growth and money is not really the point. They are findependent so it’s all a bonus anyway. Doug Hoyes: Well it all comes back to that concept of findependence then. If you have money in the bank and no debt and you want a change in career, you get laid off from your current job for example and want to start something new, no problem. I’ve got cash. Then I’m gonna take six months and start a new phase of my life. If I’m burdened with debt and obligations and what not, I can’t do it. So really in order to be mini retired, to take a mini retirement, you’ve got to have your house in order first. One comes before the other I guess. Is that right? Jonathan Chevreau: I think so. Let’s face it. A lot of mini retirements are people who are laid off and they get a severance package. If you’re a big executive, you can do very well. That amounts to a forced mini retirement. They may find another job but the point is, if they already have Findependence, then a severance package would just a big giant, you just add it to your income, your investment portfolio so now instead of generating $20,000 a year, instead of making $25,000, if you don’t break into the capital. On the other hand, if you’re completely flat broke when you get laid off, the severance package typically just gets thrown into your cash account to handle your bills month-to-month, you don’t get ahead and you’re just under the gun to go and find another, replace that former income. It just doesn’t make sense to not strive for it. Doug Hoyes: And do you think a mini retirement is something you should actively plan for then? That should be built into your plan or is it something that you kind of as the opportunity arises, you take it. Like in your example of, okay, I lost my job, I’ve got a severance package, I guess I’ll take a mini retirement now or is it something that’s actually important enough you should plan for in advance? Jonathan Chevreau: I remember the concept of mini retirement long before Tim Ferris. I once had a professor, she taught TV and radio and even then, every five years she planned for a trip. She was going to Greece one year I remember so I think the concept has been out there a long time. I think it’s better if it’s planned. Certainly if you’re going to go back to school, you gotta plan that. You gotta apply to various places. You gotta put the cash aside, you gotta find a residence, all the rest of it. I think the idea of the bucket list vacation where it needs to be planned in advanced, whether it’s a world traveller or something like Jim Rodgers, investment biker. First he drove a bike across Europe, the world and then he did it again with a yellow Mercedes. Those kind of life altering mini retirements, where you get a book out of it, that kind of thing needs to be planned and ideally, you line up a contract with a publisher as well and you write a blog on it. So like anything in life, planning makes a heck of a lot more sense than randomly bouncing off the circumstances that life deals with us. Doug Hoyes: I think those are excellent ideas and hopefully it’s given everybody whose listening something to think about it. It’s yet another reason why you want to become debt free because that then gives you the flexibility to do all these things and frankly, it would be kind of cool at the age of 30 or 40 or 50 or even 60 to say hey, I’m gonna take six months and I’m gonna drive around the world or travel or write that book that I always wanted to write or start my music career or whatever crazy thing it is that you’ve always wanted to do. Make that your target and if it works out, great. If it doesn’t work out, oh well, it was one chapter in my life. I move onto something else. But I agree with you, planning is probably the whole key to it. So that is excellent advice. Very interesting. I think a lot of food for thought. I appreciate you sticking around for the bonus segment. Thank you very much. Jonathan Chevreau: Anytime, Doug. It was my pleasure. Doug Hoyes: Great. Thank you. Thanks for listening to the podcast only bonus segment of Debt Free and 30. For more information on today’s show, please go to Hoyes.com. That’s h-o-y-e-s-dot-com and type the word podcast into the search box for more information on every episode of Debt Free in 30. Until next week, this was Debt Free in 30.